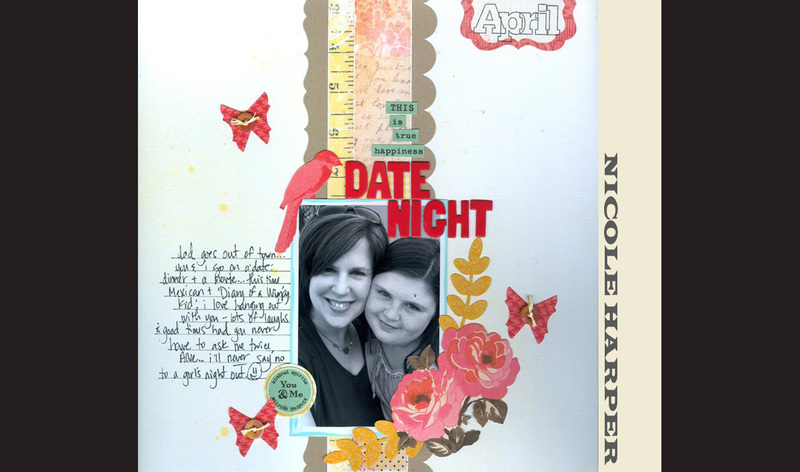 First, our guest designer. 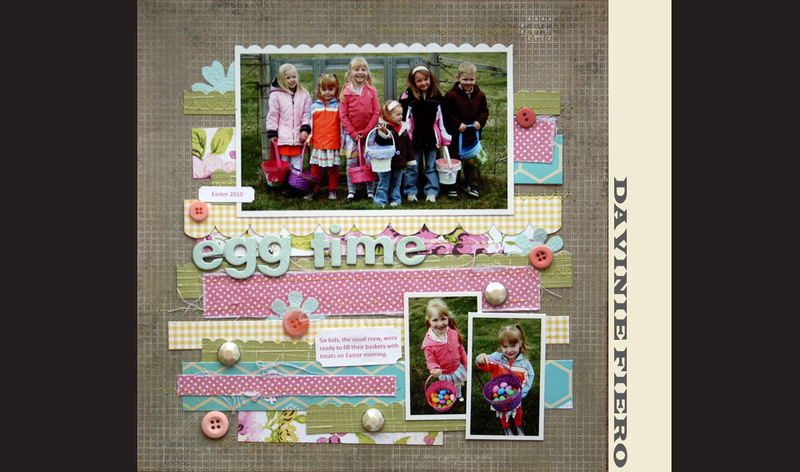 I love what she did with the chipboard bubbles. I don't know exactly how she got that effect, but it looks awesome! And those itty bitty butterflies? So cute! 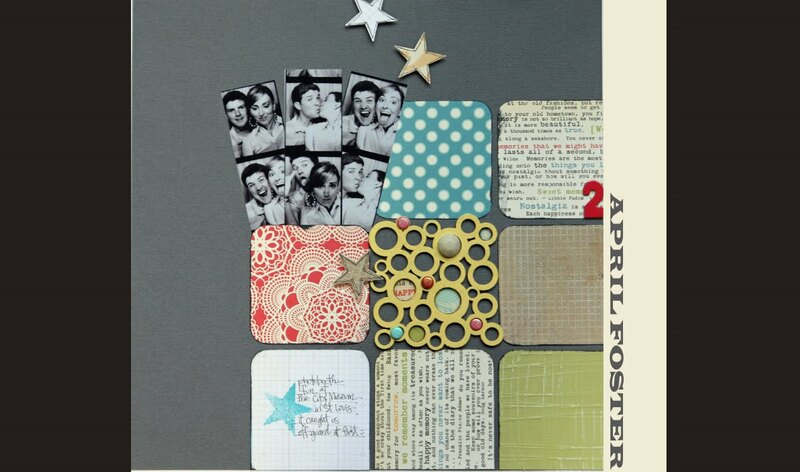 This layout by April jumped out at me right away. Look how she painted the bubble chip and used it to house all sorts of little bits. And those fun photo booth pics randomly shuffled in there are perfect. 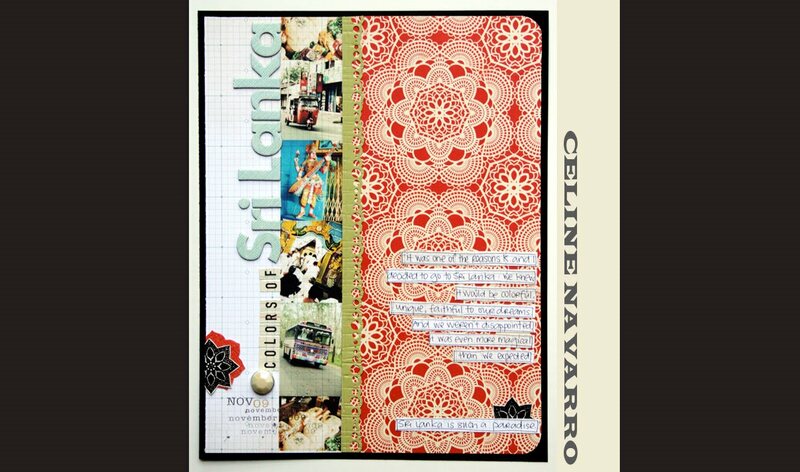 Celine's row of colorful photos mixed with the red doily paper drew me in right away. 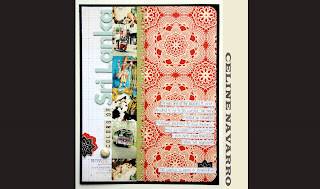 Her stamping with the doily stamp is gorgeous too! 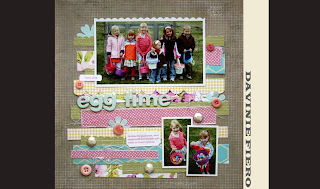 Davinie's "Egg Time" layout feels so springy and happy with those strips of paper. 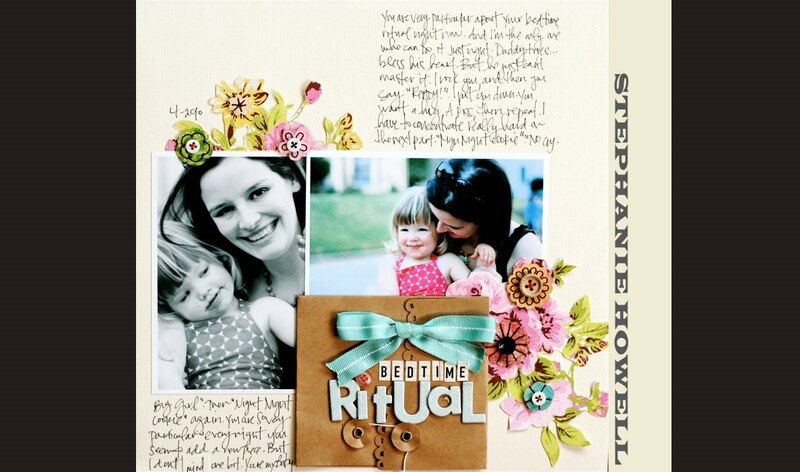 Love how she used border punches on some and mixed the flowers/buttons/odds 'n ends in there too. Beautiful! Jenn's layout scores bonus points for having such a cutie as the subject. ;) But beyond that I love this one for the colors, the way she used the paper flowers, and really the whole dang design. Gorgeous! So, who else thinks Joy is supermom right now? 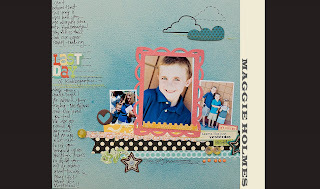 A brand new baby, three other big kids to juggle, and she knocks this kit out of the park with loads of fabulous baby pages. LOVE! This one was my fave.... look at that little bee?! And Jovi... precious! Kelly's beach layout makes me want to hit the sand and surf! 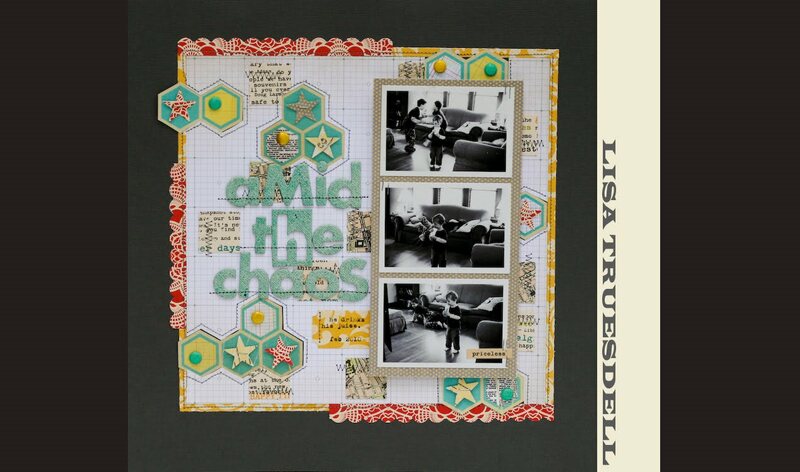 Love the circles, the title work is amazing, and the photos are Kelly's trademark gorgeous-ness. Perfect. I couldn't resist picking this one in Kimmi's gallery. The grays and blues and pinks all combine to make a gorgeous page. Her layering is amazing too! 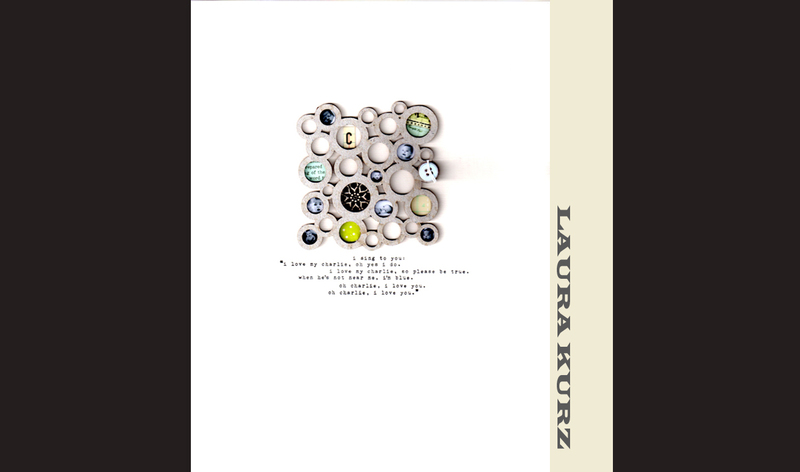 Laura's simple page makes a huge impact. Look at the teeny pics and goodies she included in the bubble chip. Wow! 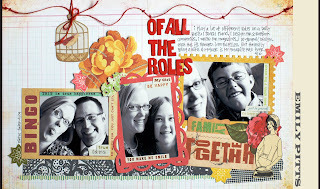 Lisa's use of the SC paper makes me wish I had more left over so I could lift this idea. I LOVE how she stitched around the paper cut outs. The whole design is awesome. 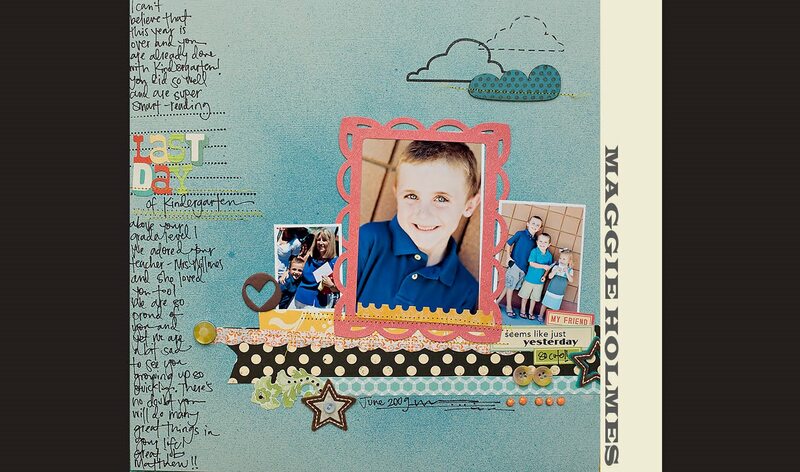 Love that Maggie used a pink frame on a boy page. 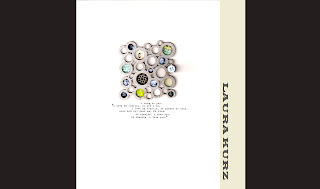 Love how she mixed the cloud stamp with the cloud chip. Love the journaling all up the one side. Love! Look at this beautiful mama/daughter photo! And Nik created a beautiful page to match! 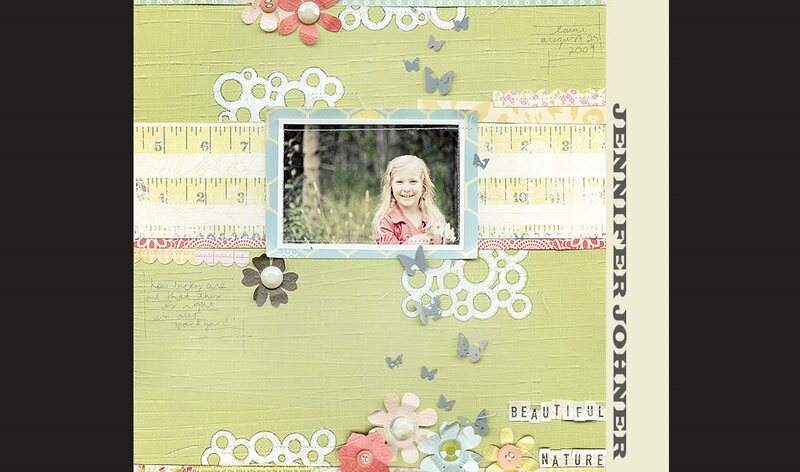 She totally rocked the die cuts here...LOVE it! I am so intrigued by this page of Sasha's. It's one of those layouts that you can just study and study and STILL find new details to take in. Wow. 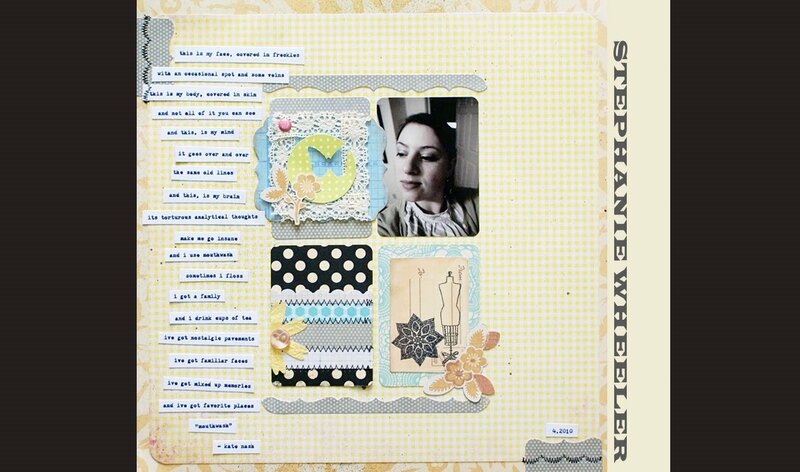 I love the hand cutting Steph H. did in this layout. It's something I thought of doing with that paper, but didn't dare. She made it look amazing. 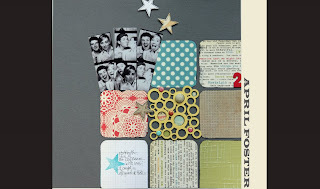 Love the mix of b/w and color photos and of course all her journaling. I'm inspired!!! Stephanie W. mixed so many cool elements on this layout. I just keep looking at it and finding more bits to love! So lovely! How stunning is this maternity pic? I wish I looked that good at the end of my pregnancies!!! 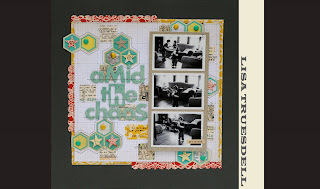 Love the quilted paper and the way Susan used it here. The colors and mix of patterns is beautiful! 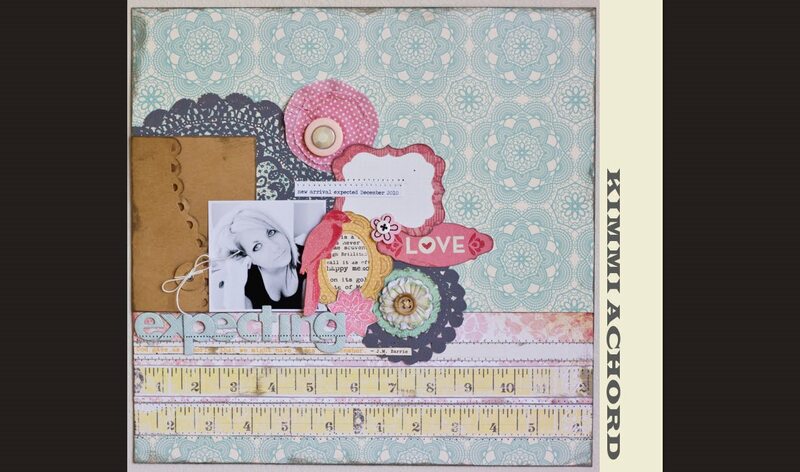 I loved this layout by Tina as soon as I saw the thumbnail on the slide show! The red title, the bits of paint, the die cut use... fabulous. 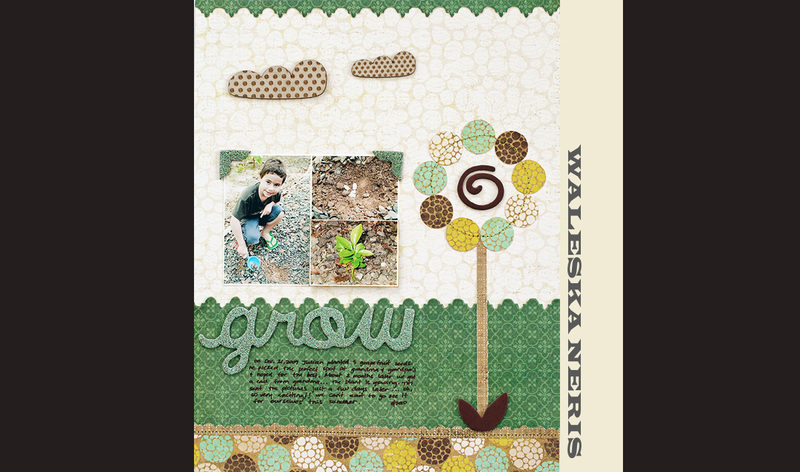 How cute, cute, cute is Waleska's page with that little tree?! Ahhhh! So creative and clever! Definitely a lift-able idea! Phew! I think that's it. 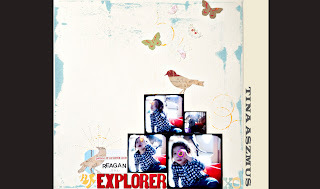 :) I hope you were able to see something you loved in each of these layouts too. Sometimes hearing what someone else liked about a layout can cause you to see something in a totally different way that you had before. Thank you DT for being so talented and inspring!!! this DT is such an inspiration. such stunning lo's. cant wait to get my kit + extra's. So much inspiration!! Love the SC DT! Great work ladies! I love all of the ways the bubbles were used...so versatile! I must say that the Granny's cupboard is my favorite kit thus far. The entire design team came up with such beautiful layout and creative use of the kits. I felt extra inspired and motivated to create my own layouts when the kit arrives on my front step in May. 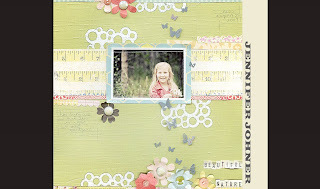 Also thank you for having Jennifer Johner as your guest designer:) I LOVE her style and she is a fellow Canadian! Love the bubble chips---Where do I get them? This is why I love Studio Calico sooooo much! Your DT is awesome. 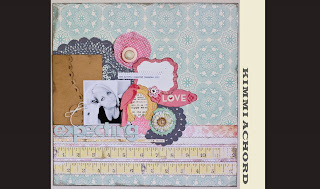 So much lovely inspiration!!!! 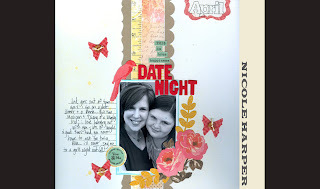 National Scrapbook Day at Studio Calico. Insider Tips - dye your tags using Maya Mists!